… and a very warm welcome to my dog blog. I’m so pleased that you’ve found me. I do hope you will enjoy reading about the trials and tribulations of my great adventure. I would love it if you joined in the saga by dropping me a line in the comments box. As you will see I’m going to need all the support I can get. this my v. v. v big tail! I started my blog in 2015 as a young orphan puppy, from West Cumbria in the United Kingdom. 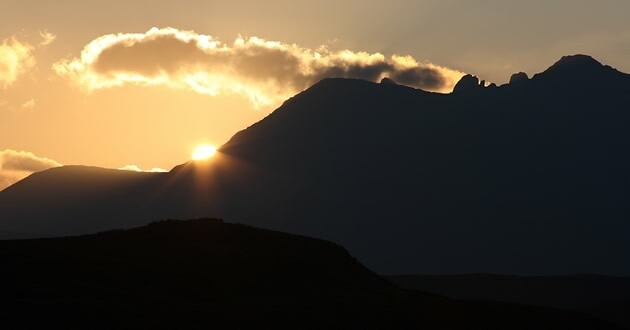 It records how – by walking over 1,000 miles and climbing the 282 Scottish mountains over 3.000 feet (The Munros) – I aim to raise £32,000 for two v. v. v good causes. I have promised not to use any of the dosh for even a tiny morsel of a treat, how hard is that? Me, an agile young collie and my person – a creaky aging thing (called B) – aim to complete the task by the time I am 10 and she is 70. We are to spend many hours in some of the most wonderful and remote parts of the UK: walking, camping, eating, drinking, writing and growing ever closer and closer. Scary map of 52 Munros completed, and those still to do 235! This is our story from a canine perspective for a change. The money we raise will be spilt between a charity for search and rescue dogs, and Canine Partners, which trains assistance dogs to support disabled people. These dogs are sooooooo clever. This is Bumble and Sandra’s story. I am in love with Bumble. Ben Speak – Understand the dogisms, and the odd philosophical musing in my blog. Ben’s Annual Reviews – A summary of my little world, one post per year. Ben’s Reads – My gift of reading just for you, in my recommended reads. Ben’s Team – A slide show of those in commerce giving me a paw up. Ben, The Dog Poet – check out my back log of verse and doggerel. Constitution/Donate/Contact – Check out my credentials, donate, or contact me. Doggy Dementia – Ben’s top tips – Written in tribute to our old girl, to help others. Munro Posts – All my Munro posts, copied and arranged in chronological order from the start to finish, in one place. You tube – Search and Rescue dog doing their thing. That was hard work, Need sleep. Thank you so much for coming to visit a dog poet. My poems for Colleen’s weekly poetry challenge are a take on life from a canine perspective. We poets – and to date I seem to be the only dog poet – write one of the structured poems permitted and have to integrate, as synonyms, the two words given as a prompt. This week the word are spring and sing; I am doing a Tanka. However, look at what I’ve got now and, of course, I had to write a poem about it. Last Monday my afternoon slumber was badly disturbed, or so I thought at the time. In Ben’s life, mornings are all about playing ball in the forest for a couple of hours and, after all that exertion, afternoons give way to lots and lots of zzzzzzzzzzs; life’s not all bad. Being a creature of habit, I’m not at my best when such a well-oiled routine is interrupted and, therefore, I was in a foul mood when woken and directed to the garden (nature’s own public convenience), before getting into my seat in the car. Arriving at B’s work to collect her early perked me up no end, but my body clock was seriously confused; what was going on? We started back towards home, but then went sailing (well, OK driving) right past the end of our road. Curiouser and curiouser, I thought, but such a lot of thinking was beginning to make my headspace hurt and the anxiety butterflies had started their workout in my tummy. There really is only one response to such uncertainty, so I thumped down on my seat – to let my feelings be known – and then proceeded to catch up on some shut-eye. When the motion of rubber on tarmac became uneven I was jolted into consciousness and serious worry commenced. There was nothing recognisable here that could anchor me to time or place. The familiar dance of the butterflies I had experienced earlier became a frantic workout, involving cartwheels, back flips and double somersaults. We had fetched up by some ruinous mill-type building, with portacabins and lots of cars, seemingly abandoned, decorating the landscape. Not only was the unfamiliar a cause for concern but B and David immediately deserted me and I didn’t know if they would ever come back. As you can imagine, I followed their footsteps with my eyes out on stalks and my neck stretched to the back window, which is a very long way, even in our little Fabia. Well, what a funny thing. B and David were giving one of those abandoned cars the once over and, before you could say “Ben, meet your new Munromobile”, B had driven off in it with a strange man, and David was sitting beside me. It turns out that my van is being traded in for a newer model. Oh my goodness me, you should see it. Well, actually you can, here’s some photos. Will you take a look at that! The mileage is only just over half way round the clock (whatever that means), and everything works as it should, which is a real novelty. Now the van won’t blow a fuse if she forgets the back door lock is dysfunctional, and neither will she get the key stuck in the passenger lock, because that one doesn’t work either. The audio system does the job properly too, which means melodious tunes. No longer do musicians sound as if they are undergoing some very nasty examination while trying to sing at the same time. And, if that isn’t enough, just look at the paintwork. I know appearances are only skin deep but I can do shallow if it means a spiffing car. I can tell you, I will be sitting up very proudly as we make for Munro country, waving my paw as if, for all the world, I was related to royalty. And….., as if that wasn’t enough, very soon it is going to look like this – hells bells! When B came back from her test drive she asked for my opinion, and obviously that was a no- brainer. What adventures we are going to have as veritable owners of our Renault Kangoo, which is seven years younger than my van. I wish B could lose seven years just like that. Then we might be able to get up our Munros one heck of a lot quicker. I’m going to call my new car/van Tanka. It’s after the poetry competition I enter most Tuesdays. While a Tanka is a form of poetry originating from Japan, my new Munromobile looks a little bit like a tank and drives like pure poetry in motion. We got Tanka from Fraser Murray Cars Sales in Penicuik, near Edinburgh, and his is a v. v. v commendable outfit, getting lots of those five star things. I even got a donation in my fundraising pot. I’m going to add Fraser Murray Car Sales to my team, when I get back from my weekend away. Me and B are telling everyone to get their cars there. I couldn’t sleep on the way back home. My tummy was in such a state. I don’t even know how to describe it. I had got so v. v. v excited, but now there was another drama going on and the butterflies were in free-fall. What was going to happen to myvan. B and me had started our big Munro challenge in it and, in fact, it had been our accommodation for the first 50 Munros. I know it had let us down a few times, and had more quirky qualities than you could shake a stick at, but it had character and I had grown to love it. We had even identified our own special song in it; albeit with Ronan Keating singing in a pitch something akin to soprano. I also got worried about Micky, who had come back for shelter again this year, as winter approached; how would he keep warm now? Apparently, the new model was top security, not even a little field mouse could gain entry. Then there were all my mini paw prints, each one denoting a Munro I had climbed. Where could I put them now, with nine windows taking up all the space? Oh dearie me, now I wasn’t so sure at all. I know B’s tummy was in a similar state to mine, and I believe hers started going wobbly when she produced that thing they call a credit card. Me and B had a big conflab when got home. B reassured me that we would find somewhere to put my paw prints and, while she is going to get a bit of kit that becomes a bed, for the sake of her old bones, I can still have my cushion beside her. Also, and oh this took my breath away, as Micky hasn’t been back for quite a while now, it is highly likely that he is a goner. B was still going on but by this time my head space was like mince, and I was flat out dreaming of a Renault Kangoo parked far below towering Munro peaks. Thank you so much for coming to visit a dog poet. 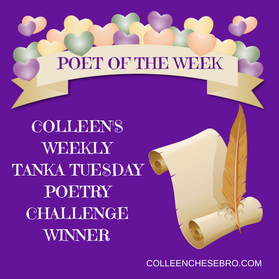 My poems for Colleen’s weekly poetry challenge are a take on life from a canine perspective. We poets – to date I seem to be the only dog poet – write one of the structured poems permitted and have to integrate, as synonyms, the two words given as a prompt. Though, for the first poem of each month, we can choose our own words. This week I have chosen the words scent and sad and I am doing a short Haibun , followed by a Tanka. The Haibun is a piece of prose, with a title, written in the first person canine singular, and it occurs in the present moment. The poem that follows – never seeks to repeat, quote from or explain the prose. It should reflect some aspect of the prose by introducing a different step in the narrative through a microburst of detail – seemingly different, yet somehow connected; gosh! To be honest, I’m not sure I’ve captured all that but, then again, I’m only a dog and I’ve done my best for my first attempt. The Tanka that follows is structured in 5 lines, with a syllable count of 5, 7, 5, 7, 7. I’m pretty sure I’ve managed that, which isn’t bad for a dog, even a dog poet. She entered my life as a burst of starlight on a winter’s night, igniting my senses. The sky is now bluer and mown grass more fragrant, while autumn leaves laugh and crackle under foot. Our walks in the forest inject my heart with joy and – with soft steps – I dance, trying to catch moving shadows on the path. Here, verdant trees – swaying in the breeze – filter sunlight. Though – of course – being a dog, my senses will be extinguished when her smell is gone. Each moment a crying shame. Drooping, lifeless, sees no sun. You can also read all about my big walking charity challenge here: Mucky Boots and Flawless Paws, but that might keep you awake at night, or possibly give you nightmares – hee, hee! Thank you so much for coming to visit a dog poet. My poems for Colleen’s weekly poetry challenge are a take on life from a canine perspective. We poet’s write one of the structured poems permitted and have to integrate, as synonyms, the two words given as a prompt. For the first poem of each month we poets choose our words. This week I have chosen the words meaning and passion. This weeks poem is about how me and my person feel when we get to the top of one of the big mountains on our challenge. Thank you so much for coming to visit a dog poet. My poems for Colleen’s weekly poetry challenge are a take on life from a canine perspective. We poet’s write one of the structured poems permitted and have to integrate, as synonyms, the two words given as a prompt. This week the words are slow and work.